By studying climate changes that took place thousands of years ago, we can better understand the global climate system and predict the Earth's future climate. A multi-organization research team led by Professor HYODO Masayuki (Research Center for Inland Seas, Kobe University) has discovered evidence of rapid climate changes on a millennial-to-centennial scale that occurred 780 to 760 thousand years ago. The findings were published on August 30 in Scientific Reports. During the 2.6 million year Quaternary Period, the climate repeated a glacial and interglacial cycle, caused by changes in the geographical distribution of solar radiation due to orbital changes including those of the Earth's orbit and the tilt of its axis. These changes are regarded as "Milankovitch cycles", over 20,000 years in period. But in the Holocene and last glacial periods, a number of millennial-to-centennial scale climate changes have been observed. Such rapid climate changes have scarcely been reported before the last glacial period. In the interglacial period between 780 and 760 thousand years ago, the Earth's orbital patterns were quite similar to the current (Holocene) era, so this interglacial climate could be useful in predicting the Earth's future climate. 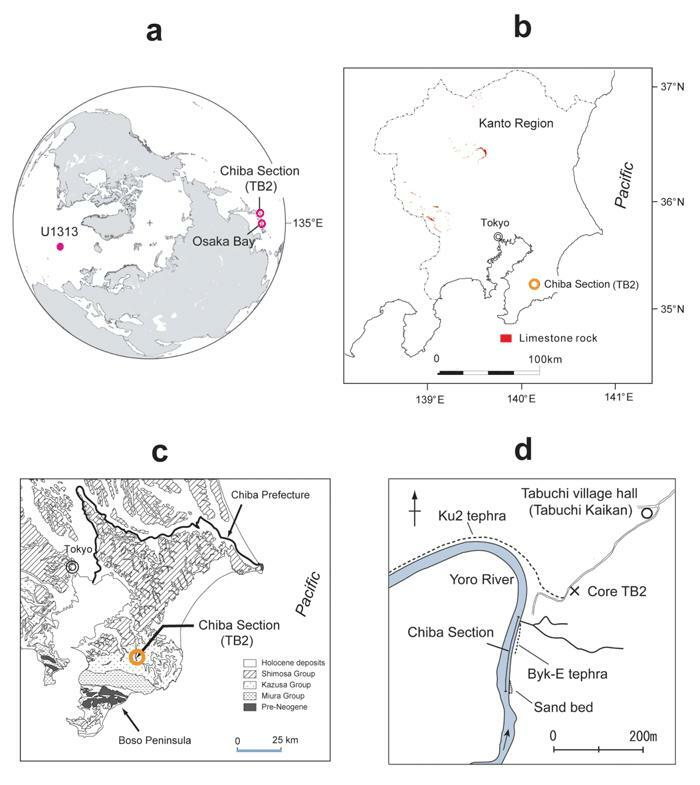 The research team focused on the Kazusa Group (Chiba prefecture, Japan), which has the fastest sedimentation rate in the world for strata of that era, and obtained high resolution paleoceanic environmental records every 10 years. When combined with records from Osaka Bay and the North Atlantic, they found evidence of multiple instances of rapid warming and cooling across all three regions at the same time. The data includes the unusual phenomenon of a rapid temperature rise with cyclicity suddenly finishing with a cold event. The cold events occurred at the same time as the great iceberg flow reached mid-latitudes in the North Atlantic, so they are thought to be caused by meltwater that covered the North Atlantic Ocean. This cyclic warming and rapid cooling repeated twice just after a geomagnetic reversal, a key event for the Early/Middle Pleistocene boundary, and a third time about 10 thousand years later. All occurred after the Earth had recovered its geomagnetic strength. This shows that the second half of this interglacial period, namely the earliest stage of the Middle Pleistocene, was a time of extreme climate change when ice sheets expanded and shrunk causing changes of several meters in sea levels, repeating every 500 to 2000 years. The phenomenon of rapid temperature rises modulated by bi-centennial cycles ending with a sudden freeze only occurred during a very brief portion of this interglacial period, during the two warmest periods. There is a high possibility that this 200 year period marks the de Vries Cycle (205 years), when the climate was particularly sensitive to solar activity. Researchers will now verify whether the same phenomenon can be observed in other regions. Evidence from the southern hemisphere will be the key to showing whether it was a global phenomenon. This discovery is very unusual among the climate warming that occurred in the past, as well as being an important key to learning about the diversity of temperature rises and understanding current global warming. Additionally, this discovery was made in the Chiba Section (Japan), a candidate section for the Early/Middle Pleistocene era global boundary stratotype sections and points (GSSP), currently under review by the International Union of Geological Sciences. These findings provide further evidence for the academic value of the Chiba Section.